SOME STRANGER was formed to create left of center music that wasn't afraid to push the weird and noisy aesthetics the same as it wasn't afraid to lean into its pop influences and hooks, an admittedly delicate and difficult edge to ride. "Meet In Secret, Speak In Code" was written and recorded across 2013-2014 as the followup to SOME STRANGER's praised debut s/t EP released on Robotic Empire Records. However, unexpected turns, life in general, getting booted off reality TV, and grander opportunities gently set the finished record on a shelf until 2018. "Meet In Secret, Speak In Code" is an ambitious record, constantly at war against sameness and expectations, filled with spacey cat noises and silky smooth vocals. 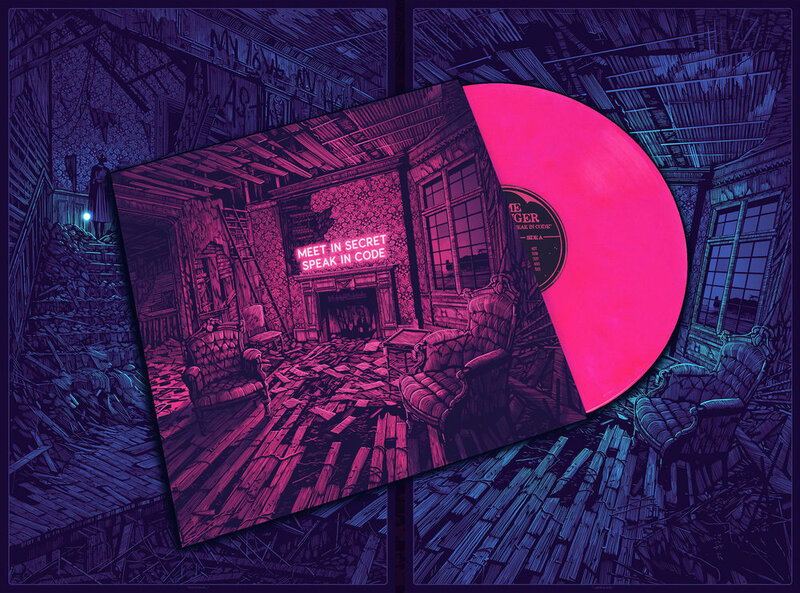 Limited edition vinyl Preorder of 300 on Pink vinyl housed in a gatefold sleeve featuring artwork by Daniel Danger and lyric booklet. Also available is a set of 24x36" 7-color screenprints featuring the artwork. A diptych pair of two 24x36" 7-color screenprints, designed by Daniel Danger and used as the album artwork for "Meet In Secret, Speak In Code". Signed & numbered edition of 150 in each colorway. Printed by D&L in Seattle WA, one of the top print shops in the country. Ships in a 4" double-walled tube, wrapped in kraft paper. $120.